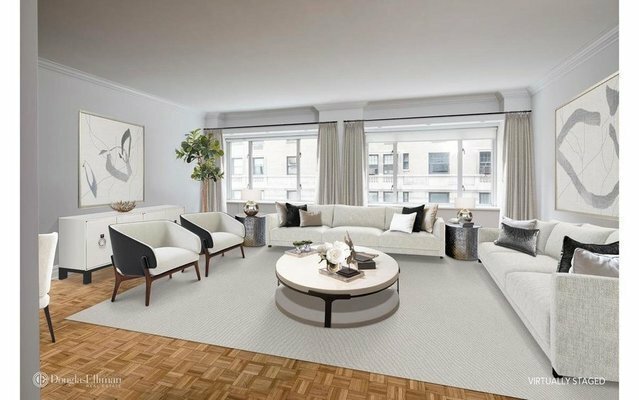 Elegant co-op apartment centrally locatied at Park Avenue and 58th Street in the heart of the city's best neighborhood. This spacious 2 BR apartment WITH HIGH CEILINGS throughout, parquet floors, and thru the wall air conditioning. A gracious entry leads you to a large north facing living room and dining area filled with day light. Spacious master bedroom also with north exposure and en-suite bath. Large second bedroom with en-suite bathroom. Eat-in kitchen features stainless steel appliances and granite counter tops. Storage space included . 475 Park is renown for its white glove service. pied-a-terres allowed. No pets. Buyers to pay 2% flip tax.